The International Cultic Studies Association (ICSA), the foremost scientific organization on the study of cults and their effects, produces a list of attributes common to cults. One of these deals specifically with the question of obedience. In cults, “The leadership dictates, sometimes in great detail, how members should think, act, and feel.” Yet the Bible speaks highly of obedience. Jesus Himself said, “Not every one that saith unto me Lord, Lord, will enter into the Kingdom of heaven, but he that doeth the will of my Father which is in heaven.” While obedience clearly has a role in the Christian ethic, when a faith tradition begins to abuse its adherents’ obedience, it begins to take on the nature of a cult. What role does obedience play in The Church of Jesus Christ of Latter-day Saints (the Church of Jesus Christ), and its members, often inadvertently called Mormons? This article explores obedience in LDS theology, rhetoric, and practice. Because obedience plays a role in both traditional religious theology as well as in cults, I want to examine LDS theology on obedience in comparison to obedience theology of other major Christian denominations. I chose to look at the three sects, besides the Latter-day Saints, which make up the most popular faiths in the United States, the Catholic Church, the Southern Baptist Convention, and the United Methodist Church. In Catholicism, obedience to church-administered ordinances is the key component to receiving salvation. In addition, Catholicism views obedience to superiors as a part of the natural order that ought to conformed to. The Southern Baptist Convention views humankind as incapable of sustained obedience, but that obedience is owed to God as a result of our relationship to Him. The United Methodist Church avoids the description of obedience, and even praises civil disobedience. The doctrine however, does encourage obedience to the commandments, but only as motivated by a love for God. The Church of Jesus Christ of Latter-day Saints also encourages obedience to God. Believing that through Christ’s sacrifice mankind may be saved “by obedience to the laws and ordinances of the Gospel,” Latter-day Saints emphasize the Biblical verse John 14:15 “If ye love me, keep my commandments.” However, their understanding of obedience is more nuanced. While the motivating factor of love for God is critical, following the commandments is not a icing on the cake, but a critical part of the religious recipe. For Latter-day Saints this connection is instinctual. They believe, “And when we obtain any blessing from God, it is by obedience to that law upon which it is predicated.”  Within the context of LDS theology, obedience acts as a tool for ensuring positive outcomes. This approach is very naturalistic in nature, and can be found even outside religious contexts. Obedience to a doctor’s order to eat oatmeal, for example, anticipates the desired result for lower cholesterol. 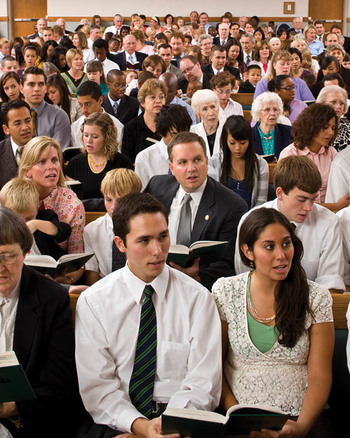 For Latter-day Saints obedience is not a macro structure which organizes the entire religious experience, but rather a micro experience which informs each commandment and sermon. Much can be gleaned about the The Church of Jesus Christ’s view on obedience from how it is presented in its scripture. Many of the scriptural accounts of obedience that are read and revered by Latter-day Saints come from the Bible and are shared with other Christians. These stories include Saul rebuked by the Lord for disobeying Him and saving animals to sacrifice from captive cities wherein every living thing was to be destroyed. And the widow woman being blessed for obeying Elijah and giving him her oil and flour. They also include stories of Daniel, and Shadrach, Meshach, and Abednego being blessed for obeying God’s law, thus disobeying the King. These stories teach that obedience is valuable when given to God. Significantly, Latter-day Saints expand on several Biblical stories involving obedience. The first is the Garden of Eden experience. In the Biblical telling of the story, God punishes Eve for disobeying Him and eating the forbidden fruit. Christians blame all the pains and struggles of humanity on this act of disobedience. Scripture specific to The Church of Jesus Christ speaks at length about this experience. These verses, however, praise Eve and see her decision as crucial for the advancement of humankind. If The Church of Jesus Christ manipulated obedience from its members, we would expect the ramifications of Eve’s disobedience to be amplified by the faith, but instead the positive results of her choice are emphasized. The choice in the Garden of Eden appears to have been constructed to guarantee the free agency of Adam and Eve, and thus of Mankind -- there is no choice without opposites to choose from. There are also scriptural stories specific to The Church of Jesus Christ that deal with obedience. Perhaps the most significant of these stories deals with what Latter-day Saints call the pre-mortal life. 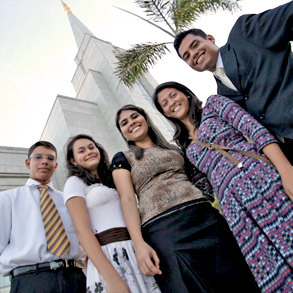 Latter-day Saints believe that everyone who has lived on Earth existed previously in a spiritual form. Before Earth was created, God gathered His spiritual children and told them they would be sent to Earth, that they would be free, and naturally make mistakes, but that Jesus would pay the price for their sins if they believed in and followed Him. Satan spoke up in this gathering and said he would ensure everyone followed God by taking away the freedom to choose. God rejected this plan, and Satan rebelled against God. This led to a “war in heaven.” Everyone who has come to Earth to live in mortality fought for freedom in the pre-mortal realm. This story paints coerced obedience (the kind found in cults) as a tactic used by Satan. This story does not diminish the importance of obedience, but emphasizes the importance of the voluntary nature of that obedience. This understanding of obedience explains the way obedience is spoken about in The Church of Jesus Christ. My analysis of obedience rhetoric is taken from General Conference addresses by LDS apostles. General conference meets twice each year. During each conference many prominent Latter-day Saints speak, including each of the twelve apostles, and three additional apostles who make up the church’s First Presidency, its presiding body. In all, these fifteen apostles deliver twenty sermons during each conference. I looked at these sermons over the course of the last ten years, or four-hundred sermons. Of these some four-hundred sermons, seventy-five included at least one of these words or one of its derivatives “obey,” “obedient,” “comply,” “conform,” or “observe” (as in obey, not as in watch). This makes up a little less than twenty-percent, a significant number. Obedience clearly plays a role in LDS discussion; however, the way these words were used provides some insight into the role of obedience in the Church. Thirty-three of the sermons used the word once in passing, usually as part of their concluding remarks, and usually in a personal way such as saying “I have been blessed for obeying God’s commandments.” Seventeen of these sermons used the word only once within the context of blessings received for following another commandment. Most commonly, with three sermons on the subject, was the topic of the Word of Wisdom, the Latter-day Saints’ code of health. The speaker would explain that by obeying the Word of Wisdom, you would be blessed with strength and health. That this is the most common use of obedience comes as no surprise within the context of LDS theology on obedience. Eleven uses of the word were in a citation of a scriptural verse or hymn, with the word having no bearing on the larger subject of the sermon. One of the sermons used these words in more than one of the ways mentioned above, but the theme was not sustained with any substance. Of these sixty-two sermons that mentioned the idea of obedience, only three spoke of obedience in the negative, such as problems with disobeying -- less than five percent. Clearly the rhetoric of the LDS leadership on the topic of obedience focuses overwhelmingly on promised blessings for obeying a specific commandment or choosing to follow all God’s commandments. This approach excludes manipulation through fear and punishment that is characteristic of cults’ obedience tactics. This leaves thirteen sermons, delivered at General Conference over the last ten years which dealt with obedience in a more substantial way. One was within the context of how to honor parents. One discussed our need for Jesus Christ because we cannot always obey. Five sermons, including the only one of the four-hundred sermons with obedience as the primary theme, discussed obedience within the context of agency. Latter-day Saints believe agency is the God-given gift to choose right from wrong. These talks discuss at length the fight for freedom, usually citing the Latter-day Saint scripture about Satan trying to take away freedom, and conclude that the best way for us to use our freedom is by choosing to obey God. Obedience within this context is of value to God because we give it out of free-will and not from manipulation. Five sermons discussed obedience at greater length, but within the same basic rhetorical context of receiving blessings from God for obeying a specific commandment. One sermon discussed obedience within a different context, and the context most interesting for a cultic analysis. Through the comparative analysis, it’s apparent that obedience to God plays a crucial component in the the theology of the major Christian sects, whether pre- or post- salvation. This type of obedience does not threaten cultish devotion, because the interpretation and relationship with God is an individual one. What differentiates cultic obedience from Christian obedience is whether the obedience is given to God or man. Which brings us back to the final sermon I analyzed. This sermon discussed obedience to LDS Church leaders, specifically the prophet. This sermon stands out because it analyzes the relationship between speaker and parishioner. The theologies of these major faiths assume that the commandments of God, as reported by religious leaders, are accurate. This sermon however instructs followers to first test church leaders. They (followers) should pray to God for a confirmation of truth before following instructions from leaders. While the desired end result remains obedience to God’s commandments, this sermon made clear that individual decisions were the responsibility of the individual. Joseph Smith, the first prophet and first president of The Church of Jesus Christ in modern times, met with a state legislator who asked him how he kept so many Latter-day Saints behaving so well. In a quote that is oft repeated in the Church, Smith said, “I teach them correct principles, and they govern themselves.” This analysis of rhetoric in contemporary LDS leadership suggests that they follow this same essential pattern Smith described, presenting the rewards for following a commandment and then allowing individual church members to decide how to act. The Church of Jesus Christ appears to value both freedom and obedience very strongly. How do these intersecting ideas affect behavior and decisions made by Latter-day Saints and their church? The structure of The Church of Jesus Christ is hierarchical in nature. Each congregation is run by volunteers, and most adult members have a “calling.” A calling is a responsibility within a congregation; these range from teaching children’s Sunday school classes, to maintaining membership records. Each calling is under the jurisdiction of someone else. For example the children’s Sunday school teacher reports to the Primary (children’s auxiliary) president who is responsible for all such classes. The Primary president reports to the Bishop, who runs one congregation. While individuals are given a good deal of latitude in how to perform their calling, following the instructions of direct leaders is expected. There is no enforcement mechanism, however, and the expectation of obedience only extends to the calling and does not extend into members’ personal lives. For individual members of The Church of Jesus Christ, obedience results from their inspired belief. Members seek an individual witness from God of the truthfulness of the Church. Obedience is specific to the individual, and a highly personal reflection of religious faith. The reasons and results of this obedience are open and widely publicized, in stark contrast to the insulated manipulation that characterizes obedience within cults. Latter-day Saints view obedience to God and his commandments as a virtue. To Latter-day Saints, obedience is a natural principle that takes advantage of cause-effect relationships. Obedience, however, only finds its value within the context of freedom. Coerced obedience does not please God, because it violates His plan. These principles come to realization within the daily practice of Latter-day Saints. This approach to obedience does not match the demanded, compelled obedience characteristic to cults. In conclusion, the LDS church’s approach to obedience is not cult-like — far from it. This page was last edited on 29 October 2013, at 13:58.